Switzerland seems to be the cosiest place to debate world politics, but in international affairs, cracks have started to appear everywhere. Things are far from cosy right now, so how to ensure security in an increasingly complex world? That was the main subject in the latest Crans Montana Forum in Geneva. 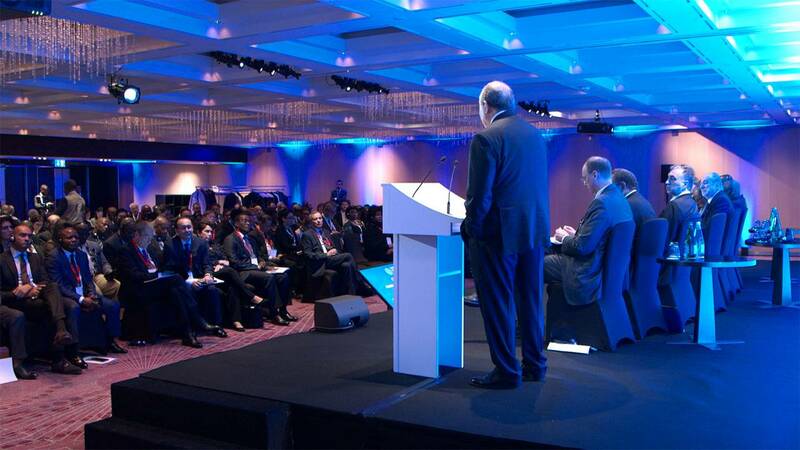 Hundreds of politicians, business leaders and representatives of international organisations gathered for the 20th edition of Crans Montana's Homeland & Global Security Forum in Geneva to debate the state of World affairs. "The world is in a bad way. Diplomatic language has disappeared. Look what's happening in Brussels, in the meetings between heads of state. Insults and accusations fly. We are opening a new era of relationships between states that is extremely dangerous, because behind this behaviour lies populism and demagogy," said the Forum's founder and Honorary Chairman Jean-Paul Carteron. The Former head of the government of Catalonia made the point that complexity is also increasing because citizens are more and more present in the political arena. "It's something that has a lot to do with the new world we are heading towards. The way we manage democracy, the way we ask our citizens to take part, to be permanently engaged, is creating "bottom up" societies, and not "top down" ones," suggested Carles Puigdemont. The president of Armenia was a professor of Physics for several decades before entering politics. For him the political debate has changed in the 21st century and we're entering an era of 'quantum politics'. "We are facing a world where the traditional institutions and organisations like political parties, institutions of power and structures, are becoming a bit less relevant than the things which are coming up in the 21st century, like social networks, social media, interconnectivity and the power of individual ideas or a powerful message. This is the new world!" claimed Armen Sarkassian. However, in an era of increasingly complex international relations, the risk of opaque conflicts is increasing too, says the former Prime Minister of Ukraine, hence her warning of the risks of adventurous leaders. "I believe that all the challenges humanity is facing today, including hybrid wars, cyber security, cyber attacks, - there is the same thing at the root of all these issues and that is aggressive and irresponsible leadership," said Yulia Tymoshenko. The Democratic Republic of Congo has also seen armed conflicts in the recent past, wars that implicated the whole region. "The African map looks like a revolver, and the trigger is in the DRC. Looking at our geostrategic position, we are in the heart of Africa, so anything that happens here, if there are problems here, then the whole continent could explode," said the Minister-delegate to the DRC's prime minister, Bruno Tshibangu Kalal. In many places in Africa the situation is already explosive: according to the Deputy Director General of the UN Food and Agriculture Organization After a decade of success fighting famine, hunger is increasing again. "The main reason is conflict, the second is climate change and the third is economic slowdown. Time is against us and we need to take bold decisions!' said Maria Helena Semedo. Bold decisions often need political courage – and that's precisely one of the main messages coming out of the Crans Montana Forum.